We have been brought here by the Imperial Academy for the Study of Primates and Machines, brought in crates across the ocean to an island, on the island to a spot at the volcano’s foot, on the spot into an enclosure presenting few, we say very few, prospects, and during the whole course of this peculiar journey we have been squeezed, pinched, and stared at, by Doctor Iris Wilhelmina K. and her candidate Wolfgang. We are an undefined species of chimpanzee with a highly developed tectonic capability. This means we have no name and that a grand hubbub is made of the fact that we stand up straight. Should you be surprised at our mnemonic faculties, please stop. Rest assured we will remember the island and the enclosure, Doctor K. and Wolfgang, and things other besides, until we drop dead in our last nest. Should you be surprised at our speech, please persist. We, too, are astonished. The words are not ours, they are not yours. Words are like armadillos, armored and occult, alive on the ground. The armadillo may set off running, or it may stay unmoved. When the armadillo feigns death, it is there and not there. One may ask: “Are you there, Armadillo?” One may leave it alone, or try to beat it dead. We find society here most confounding—especially so the outlandish operations surrounding breakfast, lunch, and dinner. To begin with we were fed without fuss, but nowadays Wolfgang refuses to simply give us our food. Instead he hangs branches of bananas and wired mobiles of vegetables assorted in the bars atop our cage. Up there they semaphore most delicious, out of our reach, and we are expected to perform an ever more bizarre exercise to get at them. We realized something was afoot when, on the usual hour, Wolfgang appeared with a ladder. He went up and mounted the food, came back down and dragged four crates into the enclosure. He then left without a word. We were amazed. Why put bananas up there? Why defile our abode with these dreadful crates, bringing back horrid memories of our voyage across the sea? We gathered we had somehow offended him and spent the day in conference. We mumbled and howled, now and then together, now and again in solitude. Time for breakfast came and went, time for lunch dito, and as darkness fell we remained unwise and positively famished. All the while, Doctor K. and Wolfgang had tried to hide nearby. This we found insanely comical. But the comedy does not exist that lasts a day. (We did shout at them, demanding variety, but they refused to answer.) Thus, we abandoned our fruitless deliberations and promptly piled the crates. We erected a tree, as it were, to the treeless bananas. We ascended and delivered the good food. Now the Doctor emerged, and in her tow Wolfgang. They were amicable and bestowed upon us a grand pampering. We presumed any and all squabbles known and unknown were forgotten—WA-HA! What prize fools we were! Next day the crates were packed with rocks! We guessed purpose must lie behind these inventions, that is to say: a studious cogitating, animated by boredom, stupidity, or meanness, or perhaps by a sudden bewilderment about how to sit down and appreciate fruit, but we have long since stopped wondering at the Doctor’s notions. Now the crates have lids and padlocks, and in the corner, there, is a black box. In sum, our meals are preceded by this extraordinary tour: Go to the box, undo the stopper in the lock, open the box and retrieve the key. Shuffle over to the crates, unlock each one, open it and remove the rocks inside. Now pile. Pile pile. One atop the other. This moronic food science Doctor K. reverently calls “the command sequence.” In it, the Doctor wishes to see a mnemonic discipline. We are not convinced. The intention seems rather to tamper with our good humour. They are like us, Wolfgang and Doctor K. Wolfgang have a teasingstick between his legs, this we know with certainty, we have seen it many times at night. We assume Doctor K. have a teasinghole, but this remains to be seen. Wolfgang too, like us, spend much of his days under the index of the Doctor. The index hovers, pointing here and there, and Wolfgang sprints, in fact sprints more than we do, in all directions governed by it. Wolfgang purports to mean something, is corrected, purports somewhat again, is rebuked. This perpetually. They find great pleasure in this game, and we can not comprehend why they do not handle each other at length, why they do not pat and scratch, tease and stroke, each other’s heads, chests, and considerable rumps, or Wolfgang’s stick and the Doctor’s assumed hole. We have stubbornly advocated this but we have not been propely heard. A significant incident occured when the Doctor tried to manipulate us with tools—how dizzyingly daft! We tried to demonstrate the proper way, but the Doctor screamed and stiffened like a board. All of her, that is to say the front, seemed to reject us, but as she raised the index and rushed off we could see that her ear lobes and general backside was contemplating joining in our pleasures. We set off in circles, yelling many OO:s to lure her back. Wolfgang remained silent and very still, in his mind busy trying to master a multitude of wild cognates and a reddening of his face. They have a valise. In the valise they keep cards with signs. Wolfgang displays a pair of signs. 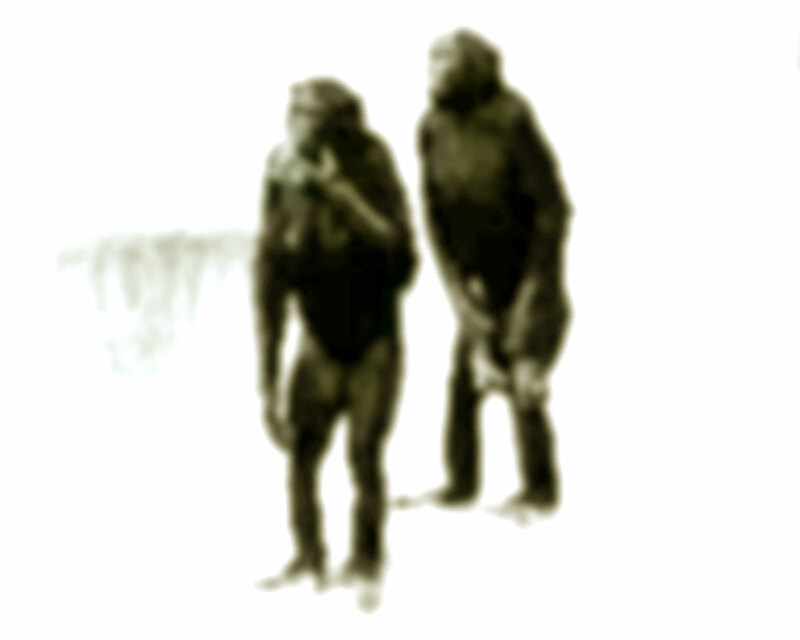 We are expected to ape, hence we show a similar pair. It is fantastically boring. Sometimes we chew the signs. The food here is not bad, but we are not quite used to it. We become gaseous and our gums itch. So the corners of the signs become useful. Today, for example, crumbled and vanished ▽ In these situations, Wolfgang and the Doctor gaze intently, or they emit a moan and leap forward to save a sign before it is chewed to bits. For beings leaning toward the linguistic they are inexplicably, not to say unhappily, attached to the signs in the valise. Their dependence makes them ill-equipped for leaps of the mind, such as diet-to-gums, cabbage-to-itch, vile-gaseous-spleen-to vanilla-scented-joy, and more in the same vein. Today, new stations were added to the tour: A blue cabinet and a red bucket. In the bucket is the all-important key. The bucket itself stands outside the enclosure. In the black box is kept sharp pair of tongs. We go to the box and retrieve the tongs. We move over to the blue cabinet and take out three sticks bundled tight together with rope. We cut the rope with the tongs and assemble the three sticks into a single long stick. We push the stick through the bars, aim for the red bucket to hook the stick to its handle and lift it. Then we pull the bucket inside our cage. From this point on, nothing new. If the command sequence used to be made up of nine steps, now there are eighteen—all this according to the proclamations of Doctor K. We remain unconvinced. We say it is twenty-two. Even one hundred and eighteen. We say with certainty that Wolfgang is a whole and proper human person, that is to say: a linguistic specimen, an arbitrarily creating being with self-generated holes in the head and grammatical griefs in the heart. We are not like you. We throw rocks and we shout KAKKA POESOS. The word may set off running. It may stay unmoved. When it feigns death, it is there and it is not there. One may leave the word alone, or try to beat it dead. Word, are you there? You can drill or dig, bite or claw, climb or jump, out of any cage put around you. No construct can resist the laughter of Apedom. Beyond the boards, the trunks of trees. Beyond the bars, the soaring wood. 1. R. Gordon-Lynch, Phonographic Impressions of Wild Primates, To Which is Annexed, An Essay, concerning the Question of the Mono- or Polygenesis of Languages, Animal & Human. . . etc. (Edisonia IX), Anapolis 1892, Appendix K.86: KA-KA-POO-ES-OZ. Revised and translated from Swedish by the author. For Hyperpulp Magazine, Rio de Janeiro, 09.16.2010.